It was with great interest that I read the article about the Marsh MR4 in OBM (February). I was at the 1976 TT when I was fortunate enough to meet Fred Marsh. I’d pulled in beside the Hawthorn pub to watch the day’s racing when I heard the wonderful sound of what proved to be the Marsh V8. 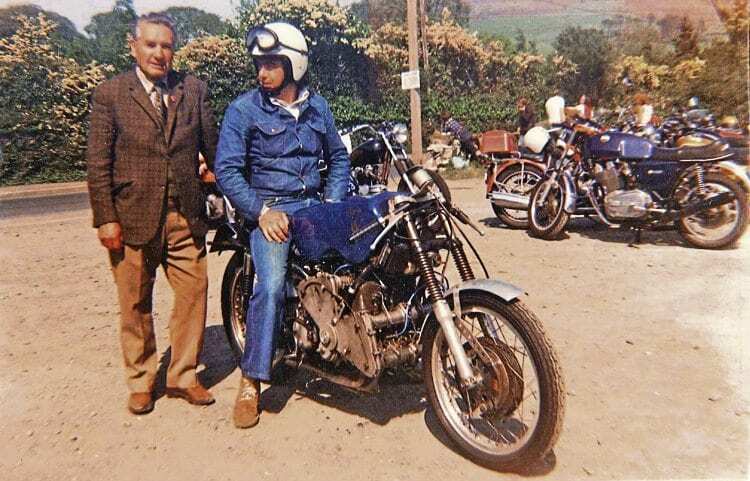 At The Hawthorn’s car park on the TT course in 1976, Fred Marsh stands beside his son-in-law, who rode in on the Marsh V8. It was ridden by Fred’s son-in-law, and as he rode into the car park, a crowd immediately gathered around him. Fred followed in a car, and the bike took centre stage at the Hawthorn that day. Fred and I had a long conversation, and he explained that the 500cc V8 had been built in honour of the Moto Guzzi V8 of the 1950s. I could see the amount of work and engineering that had gone into building the engine, but Fred was a modest man and played it down. He’d used a Norton Featherbed as the basis of the frame, but his main concern was that, with no charging system in place, he was unsure how long the battery charge would last (he had a spare one in the car). I was riding my Velocette Venom that year, and I had recently fitted a tooth belt-driven alternator from Criterion Engineering. Fred was intrigued by this, and thought it might be the answer to the problem. I could see his mind working as he studied the layout. It was an unforgettable day, and I have often wondered what happened to the Marsh V8. Will we ever see it at the National Motorcycle Museum one day? It would be good to have both bikes there, and after all, they are both British treasures. I took some photos that day on the Island, and have attached two of them. Read more Letters, Opinion, News and Features in the April issue of OBM – out now!